Equipo Nizkor - Possible 9/11 hijacking recruit transferred from Guantanamo to Montenegro. 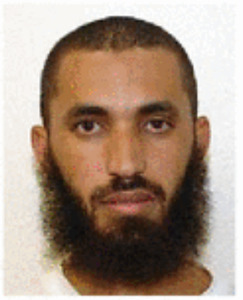 A Guantanamo detainee who may have been selected to participate in a canceled part of al Qaeda's Sept. 11, 2001 hijacking plot has been transferred. The Department of Defense announced yesterday that the now former detainee, Abdel Malik Ahmed Abdel Wahab Al Rahabi, has been transferred to the Government of Montenegro in a manner "consistent with appropriate security and humane treatment measures." US officials repeatedly warned that Rahabi was a threat. Joint Task Force Guantanamo (JTF-GTMO), President Obama's Guantanamo Review Task Force, and a Periodic Review Board (PRB) all deemed Rahabi too dangerous to transfer. Curiously, another PRB approved Rahabi's transfer in late 2014, just months after the same body said his continued detention remained necessary to mitigate the threat he posed. According to a leaked threat assessment, dated Apr. 28, 2008, Joint Task Force Guantanamo (JTF-GTMO) concluded Rahabi was a "high" risk who is "likely to pose a threat to the US, its interests, and allies." JTF-GTMO found that Rahabi was a bodyguard for Osama bin Laden and may have also been related to the al Qaeda founder by marriage, although the latter alleged detail was subsequently dropped by a review board. Rahabi "swore bayat (oath of allegiance)" to Bin Laden and "received specialized close combat training for his role as a suicide operative in an aborted component" of the 9/11 hijackings, according to JTF-GTMO's threat assessment. US officials concluded that Rahabi was one of several al Qaeda members "designated as suicide operatives in a plot to hijack US air carriers traveling across Southeast Asia and destroy them in midair." The hijackings were initially intended to coincide with al Qaeda's attacks on the East Coast of the US, but bin Laden reportedly canceled them because he feared the two parts of the operation would be too difficult to synchronize. JTF-GTMO's analysts concluded that Rahabi "participated in hostilities against US and Coalition forces and was captured with a group referred to as the 'Dirty 30,' which included [bin Laden] bodyguards and "a jihadist "assessed" to be the would-be 20th hijacker on 9/11. The latter individual is Mohammed al Qahtani, who is still detained at Guantanamo. Qahtani was denied entry into the US in August 2001 and eventually returned to South Asia. Qahtani was captured by Pakistani forces in December 2001 as he and more than two dozen others, including Rahabi, attempted to flee the Battle of Tora Bora. For these reasons and more, JTF-GTMO recommended that Rahabi be retained in US custody. President Obama's Guantanamo Review Task Force also determined that Rahabi was too dangerous to transfer. The task force, which concluded its work in January 2010, recommended that Rahabi be held in "[c]ontinued detention pursuant to the  Authorization for Use of Military Force." A Periodic Review Board (PRB) established by the Obama administration reevaluated Rahabi's case in early 2014. The PRB determined on Mar. 5, 2014 that "continued law of war detention of" Rahabi remained "necessary to protect against a continuing significant threat to the security of the United States." That is, the PRB concluded that Rahabi was too much of a risk to transfer as well, just as JTF-GTMO and President Obama's task force had before hand. The PRB cited Rahabi's "significant ties to" al Qaeda, "his past role as a bodyguard for" bin Laden, and prior relationship with the current amir of" al Qaeda in the Arabian Pensinula (AQAP). The head of AQAP at the time was Nasir al Wuhayshi, who once served as the aide-de-camp to bin Laden and became one of al Qaeda's top leaders. Wuhayshi was subsequently killed in a US drone strike in early June 2015. The PRB said that Rahabi's "experience fighting on the frontlines, possible selection for a hijacking plot, and significant training" raised concerns. The "hijacking plot" mentioned is the same one described in JTF-GTMO's threat assessment. Rahabi's fortunes changed just a few months later, however, when another PRB session concluded he could be transferred. In its Dec. 5, 2014 determination, which paved the way for Rahabi's transfer to Montenegro, the PRB did not suddenly deem him to be an innocent. Instead, the PRB said it believed that "the risk the detainee presents can be adequately mitigated." The PRB acknowledged Rahabi's "past terrorist-related activities and connections," but essentially concluded that he could start a new life. The PRB said it "considered the deliberate efforts on the part of [Rahabi] and his family to address the concerns raised by the Board in the prior full review, particularly the Board's concerns regarding his susceptibility to recruitment." His "immediate family…severed ties with his brother-in-law who is a prominent extremist," the PRB wrote in its Dec. 2014 determination. The review board also credited Rahabi's "increased candor and credibility" regarding "his acknowledgement of past mistakes," "change in mindset," as well as his "desire to reintegrate into society," among other factors. Rahabi's willingness to relocate somewhere other than Ibb, Yemen, where he was born, helped as well. Ibb has a "degraded security environment," the PRB noted. After Rahabi's transfer, 79 detainees remain at Guantanamo.